Seafood served with choice of two sides: cup of soup du jour or dinner salad, sweet corn cake, chef's vegetable, applesauce, coleslaw, rice, fresh-cut French fries, baked or mashed potato. 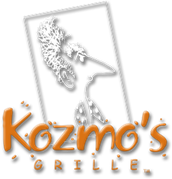 Substitute onion rings, Kozmo chips or sweet potato fries for $1. Pastas served with dinner salad or cup of soup du jour. A Pacific Rim mild white fish pan-fried or broiled. Available unseasoned or with Santa Fe, Lemon Pepper, Jamaican Jerk or Cajun seasonings. Mild white fish lightly breaded and pan-fried or broiled with choice of Santa Fe, Lemon-Pepper, Jamaican Jerk or Cajun seasonings. Three deep fried beer battered cod fillets. An 8 oz. Norwegian salmon fillet roasted in our stone hearth oven to your specifications and glazed with roasted red pepper butter. Prepared from scratch using cavatappi pasta and fresh sharp cheddar and Gruyere cheese. Topped with a panko crust and baked off to a crispy finish. Lightly seasoned and breaded chicken breast pan-fried and set atop a bed of linguini. Topped with Provolone cheese and marinara sauce. A dozen deep fried shrimp served with cocktail or tartar sauce. Red and green peppers, mushrooms, scallions, cashews and sesame seeds tossed with your choice of zesty orange or sweet chile sauce. Served over rice.